Townhall Clock, also known as Moschatel, is a very unusual plant, unrelated to other plants. 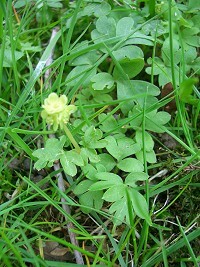 The leaves are light green with three lobes. 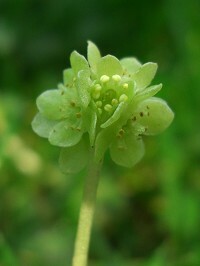 The flowers are very unusual with tiny yellow/green flowerheads (less than 1 cm across) on long stalks. Each flowerhead has five flowers, four of which face in separate directions (like a townhall clock) and the fifth faces directly upwards. Townhall Clock grows in woodland and hedgerows.